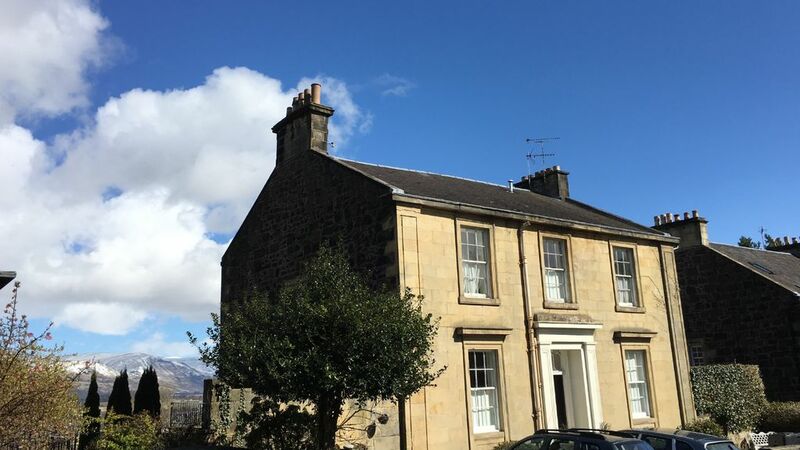 "Bonnie Views" -a beautiful period property situated in the “heart of Scotland"
"Bonnie Views" is a beautiful period property situated in the “heart of Scotland”- the historic City of Stirling. The property is spacious, bright and comfortably sleeps 6 people. It has many beautiful period features, breathtakingly ‘bonnie’ views and luxurious modern finishes. Bonnie Views is perfectly located within easy walking distance of transport links, historic sites, places of interest, cafes, restaurants, pubs and tourist attractions. We welcome long and short stay bookings. Hi I’m Rowan. I am married and have 2 daughters. I love to travel and spend quality time with my family. I work as a Family Support Worker and enjoy meeting new people. Due to its fabulous city centre location and proximity to transport links- Bonnie Views is the perfect place to base yourself when exploring both Stirling and the rest of Scotland. Stirling is a historic city which is steeped in history, it is a thriving place and offers many interesting things to see and do. Some examples are: Stirling Castle, The Old Town Jail, The Tolbooth, The Smith Art Gallery, the Engine Shed, the Vue Cinema, The Bannockburn Centre, The Wallace Monument, The Macroberts Arts and Performance centre, Blair Drummond Safari Park and The Church of the Holy Rude to name but a few. There are many stand out places to eat and drink, many rated 5* on trip adviser. A few of our favourites are; The Smithy café (2-minute walk away) serves delicious, traditional, fresh, local food-it has a lovely roaring fire in the winter, a beautiful courtyard to relax in during the warmer months and it has a lovely gift shop attached. The White Ivy Champagne and Cocktail bar (2-minute walk away) which is opening summer 2018. This will be great for special occasions and business lunches- it is Stirlings first 'over 21's only" venue. The Curly Coo (3-minute walk) which is a small traditional pub offering a huge selection of Scottish Single Malt Whisky’s, organised Whisky tasting evenings and a chess board to play whilst you sample a ‘wee dram’ or two... or three… I have added lots more local recommendations into my Airbnb “guidebook”. Bonnie views is a ground floor Maisonette, with a main door private entrance. The property has: - beautiful period features -breathtakingly ‘bonnie’ views - luxurious modern finishes - An amazing central location Bonnie Views has a large vestibule, entrance hall, 2 large double bedrooms which both have king beds (one which can be split into 2 twin beds). All beds have luxury Vispring mattresses- these mattresses are the same brand that the queen sleeps on! There is bright and spacious lounge with a door that leads to a spacious kitchen/diner. There is a luxurious bathroom with heated marble floors. And for those warm relaxing sunny days- a large garden with bbq facilities. This property is suitable for business travellers. Bonnie Views is perfectly located within easy walking distance of transport links, historic sites, places of interest, cafes, restaurants, pubs and tourist attractions. Bonnie Views is a beautifully decorated two bedroom apartment in the heart of Stirling. The view from the rear of the house is fantastic. You can see the Wallace Monument in the distance. It is close to a Tesco, restaurants and bars. We walked to Stirling Castle (close by) and to the Wallace Monument (about 2 miles). The apartment is exactly like the pictures Rowan has posted. The bathroom has a heated floor, which is fabulous. There is off street parking if you need it, which is a big plus since street parking can be hard to find. The beds were extremely comfortable and everything was clean and well taken care of. I would highly recommend this apartment and would definitely stay here again.